Following the leak of over eleven million company files from the Mossack Fonseca law firm in Panama on 3 April, many African activists and law enforcement officers have been searching the documents for evidence of malfeasance. Of course, being a client of Mossack Fonseca, whose premises were raided by Panamanian police on the morning of 13 April, and establishing shell companies in Panama is legal for nationals of many African countries. However, when those entities are part of a scheme to misprice transactions deliberately or to evade tax, they are increasingly being picked up by African regulators and tax authorities. Driving those investigations are the effects of the commodity price crash, which has sharply cut state revenue in resource-rich countries and the campaign, led by South African ex-President Thabo Mbeki, to staunch the illicit financial flows from Africa (see Chart) which his United Nations-backed investigation says are running at over US$60 billion a year. 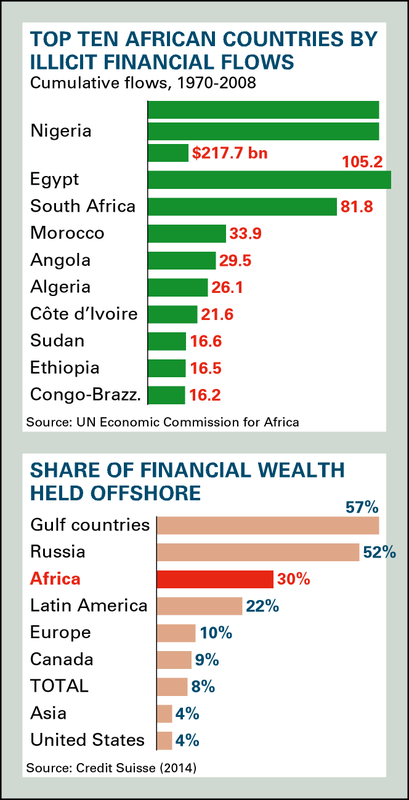 The Paris-based Organisation for Economic Cooperation and Development reckons that illicit financial flows – deliberate trade mispricing and tax evasion – out of Africa are running at three times the level of foreign aid coming in. Sierra Leone is the first country to launch an investigation into claims of deliberate trade mispricing following the Mossack Fonseca leak. It will cover transactions between the biggest diamond mine, Koidu Holdings, which is owned by Octéa Group, a subsidiary of the Guernsey-based Beny Steinmetz Group Resources (BSGR), and Standard Chartered Bank and Tiffany Diamonds (AC Vol 57 No 7, What price recovery?). Specifically, the investigators will be looking into whether BSGR or Octéa or others have extracted additional, undeclared value from rough diamonds once they leave Sierra Leone, in contravention of their contract with the government. If so, they will want to know how much Standard Chartered and Tiffany (the two companies to which BSGR owes over $130 million) know about these transactions. There are indications there may be wide discrepancies in the prices per carat of diamonds valued in country and the prices they are sold for abroad. If these concerns are validated, it would mean the country has been losing tens of millions of dollars of value from its diamond business. Documents from Mossack Fonseca reveal a complex, many-layered offshore business structure behind Sierra Leone's biggest diamond mining company, the deeply indebted Octéa. Israeli billionaire Beny Steinmetz is an advisor to Octéa's parent company, BSGR, but insist he has no executive role in the business. Independently of the Mossack Fonseca leak, AC has obtained other documents that suggest there is a wide discrepancy between the price per carat of diamonds valued in Sierra Leone (at the central bank in Freetown) and the price per carat when they are sold on through a chain of companies owned directly or indirectly by companies whose owners are related to Beny Steinmetz. In October 2014, Standard Chartered Bank, which acted as financial advisor to BSGR for the sale of its 100% stake in Octéa, wrote a confidential note to investors. It described Octéa diamonds, all of which are sourced from Sierra Leone’s Koidu mine, as offering 'high grade, quality & value per carat'. 'Koidu is one of the highest revenue per carat diamond mines in the world,' said the Standard Chartered note. It contained a graph entitled 'Koidu Historic Sales Profile', which showed that diamond values from the mine surpassed an average of $450 per carat in 2011. It sourced these figures to 'Company data'. Overall, the 2014 note put average per carat values at the mine at $410, the second highest in the world. Industry insiders say the diamonds are sometimes being valued in Sierra Leone at up to $140 a carat less than that, leaving a potentially mammoth profit margin for the exporters. As the main creditor of Octéa and Koidu, Standard Chartered would not discuss concerns about transfer pricing or the discrepancies in carat prices in its own documents. Its Regional Head of Business Communications, Lauren Callie, told AC that it was a confidential matter between the Bank and BSGR. But while Standard Chartered says Koidu Holdings diamonds are worth an average $410 per carat, if they are being valued at over $100 a carat less in Sierra Leone, it would be paying far lower taxes and royalties. If Koidu is using average prices running as low as $270 a carat, that would give the exporter a mark up of around 50%. Sierra Leone’s mining lease agreement with Koidu Holdings, dated 2010, includes several safeguards against transfer pricing. If local diamonds are being undervalued in-country, it could also prove uncomfortable for local officials. Three sets of valuators determine the price for export. One is BSGR’s own nominated valuator; the second is the government’s and the third is independent. Sierra Leone’s independent valuer is Diamond Counsellor International, run by Britain's Marriott family. It is also the government-mandated valuator for diamonds exported from Guinea and Liberia. If diamonds are being undervalued to facilitate transfer pricing, experts say it would require collusion between two or three of those groups. Acknowledging this risk, Mansaray said the investigation would spotlight the entire valuation process. Meanwhile Freetown officials are looking at the paper trail coming from the Mossack Fonseca leak. According to the ICIJ, the Panama Papers reveal that BSGR is owned by 'several foundations based in Liechtenstein and Switzerland such as Nysco and Balda'. It counts the Steinmetz family as beneficiaries. Steinmetz himself left the Steinmetz Group’s main diamond business, Swiss-based Diacor International, which is separate from BSGR and focuses on value-added part of the chain from manufacturing to retail, after allegations of corruption in Guinea surfaced in 2013. He sold his 37.5% share in the Steinmetz Group’s diamond segment, Diacor International, to his brother, Daniel, in 2014. Diacor is now owned by Nir Livnat and Daniel Steinmetz via different offshore holdings in the British Virgin Islands (BVI) and Liechtenstein. Leaked emails referred to in the Panama Papers investigation reveal that Beny Steinmetz retained power of attorney in Diacor International until it was revoked in June 2015. Its revocation was subsequently backdated to 2013, in coordination with Mossack Fonseca. 'We urgently want to finalize the cancellation and back-date the cancellation to the date mentioned in our initial request in 2013. The POA [power of attorney], dated 05.07.2007, was not only issued to Benjamin Steinmetz but also to Daniel Steinmetz and Marc Bonnant,' said one email. Another, dated 24 June 2014, shows that Mossack Fonseca then agreed to backdate the revocation of his power of attorney to 2013. However, according to documentation we have seen, Octéa Diamonds Limited, one of four subsidiaries of Octéa Ltd. and which was previously known as BSGR Diamonds Ltd., regularly consigned Koidu Holdings' diamonds via Geneva to Penford (Israel) Ltd. At Penford, the stones were washed – deep-boiled in acid – and the final prices determined before selling on to final buyers, including Belgium’s Laurelton Diamonds, the Tiffany and Company subsidiary that deals in rough diamonds and manufacturing based in Antwerp, as well as others in Belgium, India and Israel. Penford (Israel) is part of Diacor International, the Steinmetz company which works with De Beers and Sotheby’s and for which in 2015, Beny Steinmetz retrospectively gave up power of attorney, backdating it to 2013. Steps in this chain are also now overseen by Infinite Diam Ltd., a diamond sales and marketing agent founded by Patrick Saada, who was previously chairman of Koidu Holdings, director at Octéa Diamonds and is also Beny Steinmetz’s brother-in-law. Saada set up Infinite Diam, known as a rough diamonds distributor, in 2013, after Octéa abandoned grand plans to list the diamond group in Hong Kong. Saada worked for Steinmetz Diamond Group for 17 years until 2007. He resigned from Octéa in 2014. The company, also headquartered in Israel’s Ramat Gan diamond district at the same address as Penford, sells diamonds on behalf of Octéa. It coordinates each step of the sales chain and issues regular market reports on Koidu’s sales figures and values. Previously, Koidu’s diamonds were consigned to other Steinmetz outfits, including R. Steinmetz and Sons, a Steinmetz Diamond Group subsidiary, and then, from 2007, to Global Diamond Trading (GDT) Ltd., a BVI-registered, Guernsey-based, Steinmetz outfit previously known as BSGR Diamonds Trading Ltd. They were also consigned to Penford (Israel). Currently, they are consigned to Octéa Diamonds Ltd. The ultimate values achieved by this web of intermediary entities is unknown but indications from Standard Chartered and others putting average prices at $410 per carat may indicate that a chain – all under the auspices of Steinmetz-related entities – is achieving far higher prices per carat abroad before final sale than that achieved by Sierra Leone at the valuation stage. That would mean that while Octéa may be in dire financial straits, the value of Sierra Leone’s high-quality diamonds could be realised elsewhere, beyond BSGR vehicles but still in companies that are part of the Steinmetz empire. Meanwhile, BSGR is mining Koidu's remaining easy-to-reach diamonds at a pace, exporting 44,000 carats last month. If President Ahmed Tejan Kabbah has his way, Sierra Leoneans will be voting for a revised constitution as well as a new government this year. Prepared for Free Article on 24/04/2019 at 10:51. Authorized users may download, save, and print articles for their own use, but may not further disseminate these articles in their electronic form without express written permission from Africa Confidential / Asempa Limited. Contact subscriptions@africa-confidential.com.